Nature has devised several creative ways to ensure that plants are able to re-seed themselves so they can continue growing from year to year, and to enable them to become established in new areas away from the parent plant. Disbursal also ensures that enough seeds will land on rich soil full of nutrients, which gives the plant the best chance of successful growth. When seed pods break and the seeds fall into the water, the seeds can be transported to new homes where they settle in far away from the parent plant. Some seeds can float, and can be transported hundreds of miles across vast seas and oceans. Coconuts are a good example of seeds that are disbursed long distances by water. Some seeds are able to catch a ride on the wind. 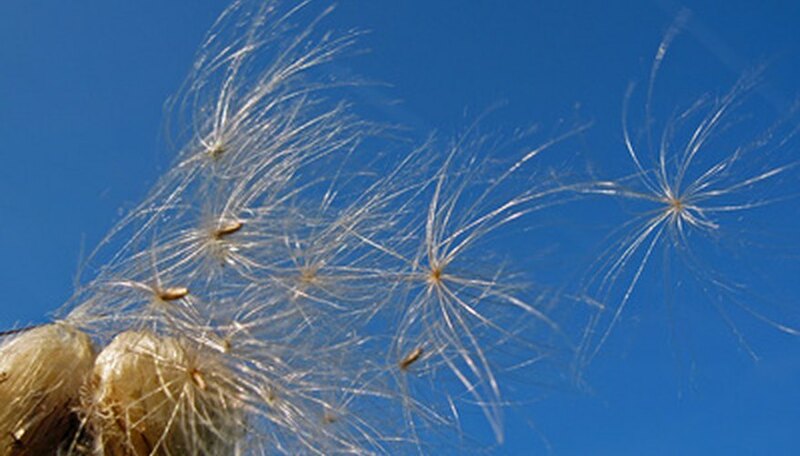 Most seeds dispersed by wind are lightweight seeds with wings or parachute-like structures that help them float on air, such as dandelions, maple, poplar or thistles. Tiny dust-like seeds, such as orchid seeds, are also easily transported by the wind. There are several ways that seeds can be disburse with the assistance of animals or birds. When birds eat fruit such as apples, cherries or raspberries, the juicy part is digested but the seed passes through. In this manner, the seed can be transported a great distance from the parent plant. Other seeds, such as acorns or walnuts, are hidden away by squirrels, who often forget their many hiding places. Other seeds, such as cockle burrs or burdock, have hooks that stick to the fur of animals, including the family dog. Many plants expel seeds when the seed pod suddenly explodes. Beans and peas can re-seed in this way, as can flowers such as impatiens or lupines. Some plants, such as Scotch broom or wisteria, expel the seeds so forcefully that you may be able to hear it if you're standing nearby. Other seeds, such as horse chestnuts, have pods that will break open when they fall from the tree. The seeds of some plants, such as the lodgepole pine tree, are disbursed by the intense heat of forest fires. Lodgepole pine trees can also disburse seeds without the assistance of fire, but some plants, such as the jack pine, have seeds contained in cones that are glued closed with resin. Without a high level of heat, the cones will remain closed. Zephyrus: Why Do Seed Disperse to Form New Plants?